For the American poet, see Maggie Smith (poet). For the American ceramist, see Maggie Smith (ceramist). Dame Margaret Natalie Smith CH DBE (born 28 December 1934) is an English actress. She has had an extensive, varied career on stage, film, and television, spanning over 67 years. Smith has appeared in over 50 films, and is one of Britain's most recognizable actresses. A prominent figure in British culture for six decades, she was made a Dame by Queen Elizabeth II in 1990 for services to the performing arts, and received the Companion of Honour from the Queen in 2014 for services to drama. Smith began her career on stage as a student, performing at the Oxford Playhouse in 1952, and made her professional debut on Broadway in New Faces of '56. For her work on the London stage, she has won a record five Best Actress Evening Standard Awards: for The Private Ear (1962) and The Public Eye (1962), Hedda Gabler (1970), Virginia (1981), The Way of the World (1984), and Three Tall Women (1994). She received Tony Award nominations for Private Lives (1975) and Night and Day (1979), before winning the 1990 Tony Award for Best Actress in a Play for Lettice and Lovage. Other stage roles include Stratford Shakespeare Festival productions of Antony and Cleopatra (1976) and Macbeth (1978), and West End productions of A Delicate Balance (1997) and The Breath of Life (2002). On screen, Smith first drew praise for the crime film Nowhere to Go (1958), for which she received her first BAFTA Award nomination. She has won two Academy Awards, winning Best Actress for The Prime of Miss Jean Brodie (1969) and Best Supporting Actress for California Suite (1978). She is one of only six actresses to have won in both categories. She has won a record four BAFTA Awards for Best Actress, including for A Private Function (1984) and The Lonely Passion of Judith Hearne (1988), a BAFTA for Best Supporting Actress for Tea With Mussolini (1999), and three Golden Globe Awards. A six-time Oscar nominee, her other nominations were for Othello (1965), Travels with My Aunt (1972), A Room with a View (1986), and Gosford Park (2001). Smith played Professor Minerva McGonagall in the Harry Potter film series (2001–2011). Other notable films include Love and Pain and the Whole Damn Thing (1973), Death on the Nile (1978), Clash of the Titans (1981), Evil Under the Sun (1982), Hook (1991), Sister Act (1992), The Secret Garden (1993), The Best Exotic Marigold Hotel (2012), and The Lady in the Van (2015). She won an Emmy Award in 2003 for My House in Umbria, to become one of the few actresses to have achieved the Triple Crown of Acting, and starred as Lady Violet Crawley, Dowager Countess of Grantham, on Downton Abbey (2010–2015), for which she won three Emmys, her first non-ensemble Screen Actors Guild Award, and her third Golden Globe. Her honorary awards include the BAFTA Special Award in 1993, the BAFTA Fellowship in 1996, and the Special Olivier Award in 2011. She received the Stratford Shakespeare Festival's Legacy Award in 2012, and the Bodley Medal by the University of Oxford's Bodleian Libraries in 2016. Margaret Natalie Smith was born in Ilford, Essex, on 28 December 1934. Her father, Nathaniel Smith (1902–1991), was a public health pathologist from Newcastle upon Tyne who worked at Oxford University; her mother, Margaret Hutton (née Little; 1896–1977), was a Scottish secretary from Glasgow. During her childhood, Smith's parents told her the romantic story of how they had met on the train from Glasgow to London via Newcastle. She moved with her family to Oxford when she was four years old. She had older twin brothers, Alistair (died 1981) and Ian. The latter went to architecture school. Smith attended Oxford High School until age 16, when she left to study acting at the Oxford Playhouse. In 1952, aged 17, under the auspices of the Oxford University Dramatic Society, Smith began her career as Viola in Twelfth Night at the Oxford Playhouse. In 1954, she appeared in the television programme Oxford Accents produced by Ned Sherrin. She appeared in her first film in 1956, in an uncredited role in Child in the House, and made her Broadway debut the same year playing several roles in the review New Faces of '56, at the Ethel Barrymore Theatre from June to December 1956. In 1957, she starred opposite Kenneth Williams in the musical comedy Share My Lettuce, written by Bamber Gascoigne. In 1958, she received the first of her 18 BAFTA Film and TV nominations for her role in the film Nowhere to Go. In 1962, Smith won the first of a record five Best Actress Evening Standard Awards for her roles in Peter Shaffer's plays The Private Ear and The Public Eye, again opposite Kenneth Williams. She became a fixture at the Royal National Theatre in the 1960s, most notably for playing Desdemona in Othello opposite Laurence Olivier and earning her first Oscar nomination for her performance in the 1965 film version. She appeared opposite Olivier in Ibsen's The Master Builder, and played comedic roles in The Recruiting Officer and Much Ado About Nothing. Her other films at this time included Go to Blazes (1962), The V.I.P.s (1963), The Pumpkin Eater (1964), Young Cassidy (1965), Hot Millions (1968), and Oh! What A Lovely War (1969). Smith won the Academy Award for Best Actress for her performance in the title role of the 1969 film The Prime of Miss Jean Brodie. Vanessa Redgrave had originated the role on stage in London, and Zoe Caldwell won the Tony Award for Best Actress in a Play, when she played the role in New York. The role also won Smith her first BAFTA Award. In 1970, she played the title role in Ingmar Bergman's London production of the Ibsen play Hedda Gabler, winning her second Evening Standard award for Best Actress. She received her third Academy Award nomination for the 1972 film Travels with My Aunt. She also appeared in the film Love and Pain and the Whole Damn Thing (1973). In the mid-1970s, she made several guest appearances on The Carol Burnett Show. From 1976 to 1980, she appeared in numerous productions at the Stratford Shakespeare Festival in Stratford, Ontario, to acclaim; her roles included Queen Elizabeth in Richard III, Cleopatra, Lady Macbeth, Virginia Woolf in Virginia, and opposite Brian Bedford in the Noël Coward comedy Private Lives. Also during this time, she starred on Broadway in Private Lives in 1975 and Night and Day in 1979, receiving Tony Award nominations for both. Smith received the 1978 Academy Award for Best Supporting Actress for her role as Diana Barrie in California Suite. For this role, she also won her first Golden Globe Award. Afterward, upon hearing that Michael Palin was about to embark on the film The Missionary (1982) with Smith, her co-star Michael Caine is supposed to have humorously telephoned Palin, warning him that she would steal the film. Her other films at this time include Murder by Death (1976) and Death on the Nile (1978). In 1981, Smith played the goddess Thetis in Clash of the Titans. For her role on television as Mrs Silly, she received the first of her four Best Actress BAFTA TV Award nominations. On stage, she won her third and fourth Evening Standard awards for Best actress, for Virginia in 1981 and The Way of the World in 1984. She won three more Best Actress BAFTA Awards for her roles as Joyce Chilvers in the 1984 black comedy A Private Function, Charlotte Bartlett in the 1986 Merchant Ivory production of A Room with a View, and the title role in the 1987 film The Lonely Passion of Judith Hearne. For A Room With a View, she also received her fifth Academy Award nomination, and won her second Golden Globe Award. In 1987, she starred in A Bed Among the Lentils, part of Alan Bennett's Talking Heads series, receiving a second BAFTA TV nomination. She starred in the 1987 London production of Lettice and Lovage alongside Margaret Tyzack, receiving an Olivier Award nomination, and reprised the role in 1990, when it transferred to Broadway, and won the Tony Award for Best Actress in a Play. The play was written specifically for her by the playwright Peter Shaffer. In the 1990s, Smith appeared as Wendy Darling in the 1991 hit movie Hook, and also appeared in the hit comedy films Sister Act in 1992 and The First Wives Club in 1996. She also received a third BAFTA TV nomination for the 1992 TV film Memento Mori, and her first Emmy nomination for her role in the 1993 TV film Suddenly, Last Summer. She won a BAFTA for Best Supporting Actress for the 1999 film Tea with Mussolini, in which she played Lady Hester. She also appeared in the films The Secret Garden (1993), Richard III (1995), and Washington Square (1997). Her 1990s stage roles included Three Tall Women in 1994, which won her a fifth Evening Standard award, Claire in A Delicate Balance opposite Eileen Atkins in 1997, and The Lady in the Van in 1999. Due to the international success of the Harry Potter movies, she is now widely known for playing Professor Minerva McGonagall, opposite Daniel Radcliffe in the title role. She has appeared in seven of the eight films in the series from 2001 to 2011. She and Radcliffe had worked together previously in the 1999 BBC television adaptation of David Copperfield, in which she played Betsey Trotwood and received a BAFTA TV Award nomination. She received her sixth Academy Award nomination for the 2001 film Gosford Park, directed by Robert Altman, and won her first Emmy Award for the 2003 TV film My House in Umbria. On stage, she starred as Madeleine Palmer, opposite Judi Dench, in the David Hare play The Breath of Life in 2002, toured Australia in Alan Bennett's Talking Heads in 2004, and starred in The Lady from Dubuque in 2007. Beginning in 2010, Smith appeared as Violet Crawley, Dowager Countess of Grantham, in the British period drama Downton Abbey. This role won her a Golden Globe Award and two Emmy Awards. In 2014, the role also won her a Screen Actors Guild Award. In 2012, she played Muriel in the British comedy The Best Exotic Marigold Hotel, and starred as Jean Horton in Quartet, based on Ronald Harwood's play, directed by actor Dustin Hoffman. In a March 2015 interview with Joe Utichi in The Sunday Times, Smith announced that the sixth season of Downton Abbey would be her last (it was in fact the last to be produced). On 30 October 2015, Smith appeared on BBC's The Graham Norton Show, her first appearance on a chat show in 42 years. During the show, Smith discussed her appearance in the comedy-drama film The Lady in the Van, which was directed by Nicholas Hytner. In February 2019, it was announced that Smith will return to the London stage for the first time in twelve years in A German Life, a new play by Christopher Hampton drawn from the life and testimony of Brunhilde Pomsel (1911-2017), in which Jonathan Kent will be taking the directorial role. Smith married actor Robert Stephens on 29 June 1967 at Greenwich Register Office, ten days after the birth of their first child. They had two sons, actors Chris Larkin (born 1967) and Toby Stephens (born 1969), and were divorced on 6 April 1975. Smith married playwright Beverley Cross on 23 June 1975 at the Guildford Register Office, and they were married until his death on 20 March 1998. When asked in 2013 if she was lonely, she replied that "it seems a bit pointless, going on on one's own, and not having someone to share it with". Smith has five grandchildren. In January 1988, Smith was diagnosed with Graves' disease, for which she underwent radiotherapy and optical surgery. In 2007, the Sunday Telegraph disclosed that Smith had been diagnosed with breast cancer. She was subsequently reported to have made a full recovery. In September 2011, Smith offered her support for raising the $4.6 million needed to help rebuild the Court Theatre in Christchurch, New Zealand, after the earthquake in 2011 which caused severe damage to the area. In July 2012, she became a patron of the International Glaucoma Association, hoping to support the organization and raise the profile of glaucoma. On 27 November 2012, she contributed a drawing of her own hand to the 2012 Celebrity Paw Auction, to raise funds for Cats Protection. Smith was appointed a Commander of the Order of the British Empire (CBE) in the 1970 New Year Honours, and was raised to Dame Commander of the Order of the British Empire (DBE) in the 1990 New Year Honours, for services to the performing arts. Smith was made a Member of the Order of the Companions of Honour (CH) for services to drama in the 2014 Queen's Birthday Honours, becoming the third actress to receive the honour, after Sybil Thorndike (1970) and Judi Dench (2005). In 1971, Smith was conferred an honorary Doctor of Letters (DLitt) by University of St Andrews. In 1986, she was awarded an honorary Doctor of Letters (DLitt) from the University of Bath. In 1995, Smith received an honorary Doctor of Letters (DLitt) from the University of Cambridge. In October 2017, Smith was conferred with an Honorary Fellowship of Mansfield College, Oxford. She was awarded the Shakespeare Prize by the Hamburg Alfred Toepfer Foundation in 1991. Smith was made a Fellow of the British Film Institute in recognition of her outstanding contribution to film culture in 1992. She was elected to the American Theatre Hall of Fame in 1994. On 10 April 1999 Smith received the William Shakespeare Award for Classical Theatre (The Will Award) presented by the Shakespeare Theatre Company in Washington, D.C. in recognition of her significant contribution to classical theatre in the US. On 9 February 2014 she was inducted into the Actors Hall of Fame. Smith had a star on the London Avenue of Stars until all of the stars were removed in 2006. In 1993, she was awarded with the BAFTA Special Award by the British Academy of Film and Television Arts. In 1996, the British Academy of Film and Television Arts presented her with the BAFTA Fellowship, the highest honour the Academy can bestow. At the 2010 Laurence Olivier Awards, she was celebrated with the Society of London Theatre Special Award. In 2013, she was awarded with the Evening Standard Icon Award. On 10 September 2012, she was honoured with the Stratford Shakespeare Festival's Legacy Award. She accepted the award, presented to her by Christopher Plummer, in a ceremony at the Fairmont Royal York Hotel. In March 2016, Smith was awarded the Critics' Circle Award for Distinguished Service to the Arts. In April 2016, she was awarded the Bodley Medal by the University of Oxford's Bodleian Libraries in recognition of her outstanding contribution to the performing arts. ^ Spears, W. (30 December 1989). "Queen Honors Naipaul, Maggie Smith". Philly.com. Retrieved 1 January 2014. ^ "No. 60895". The London Gazette (Supplement). 14 June 2014. p. b5. ^ "Film in 1959". Bafta.org. Retrieved 1 January 2014. ^ "Academy Awards Best Actress". Filmsite.org. Retrieved 7 August 2013. ^ "What do Al Pacino and Maggie Smith have in common?". Los Angeles Times. 9 July 2010. Retrieved 7 August 2013. ^ Croggon, Alison (10 June 2009). "Jewel in the triple crown". News.com.au. Retrieved 1 January 2014. ^ a b Ouzounian, Richard (10 September 2012). "Maggie Smith receives Stratford festival's Legacy Award". Toronto Star. ^ a b "Dame Maggie Smith open Bodleians Libraries' Shakespeare's Dead exhibition". Bodleian.ox.ac.uk. 29 April 2016. Retrieved 12 May 2016. ^ a b Mackenzie, Suzie (20 November 2004). "You have to laugh". The Guardian. UK. Retrieved 10 December 2007. ^ "Person Details for Margaret N. Smith, "England and Wales Birth Registration Index, 1837-2008"". FamilySearch.org. ^ Enfield, Laura (18 November 2015). "Ilford born Maggie Smith talks about starring in The Lady in the Van". The Tottenham Independent. Retrieved 16 June 2016. ^ "Orders and decorations conferred by the crown". Debrett's. Archived from the original on 29 January 2015. Retrieved 4 January 2015. ^ "Maggie Smith profile". Filmreference.com. Retrieved 8 November 2011. ^ "Maggie Smith profile". Yahoo! Movies. Retrieved 21 April 2014. ^ a b "Maggie Smith biography". tiscali.co.uk. Archived from the original on 5 November 2001. Retrieved 21 April 2014. ^ "Maggie Smith biography and filmography". Tribute.ca. Retrieved 7 August 2013. ^ Coveney, Michael (3 October 2007). "Obituary: Ned Sherrin". The Guardian. ^ The Oxford Encyclopedia of Theatre and Performance. Oxford University Press. 2012. ISBN 978-0-19172-781-8. ^ Maggie Smith acceptance speech at the 44th Tony Awards telecast in 1990. ^ "Maggie Smith". IBDb. Retrieved 22 December 2011. ^ "Share My Lettuce". The Guide to Musical Theatre. Retrieved 22 December 2011. ^ Anthony, Andrew (21 February 2010). "Vanessa Redgrave: A performer of passion, conviction and tragedy". The Observer. Retrieved 19 May 2014. ^ "Maggie Smith". Golden Globe Awards. Retrieved 22 December 2011. ^ "Maggie Smith Emmy Award Winner". Academy of Television Arts & Sciences. Retrieved 22 May 2012. ^ "Dame Maggie Smith Receives Screen Actors Guild Award for Outstanding Performance in a Drama Series". PBS.org. 18 January 2014. Retrieved 19 January 2014. ^ Utichi, Joe (3 March 2015). "Maggie Smith: Sorry, dear, but a dowager countess does not do selfies". The Sunday Times. London. Retrieved 23 March 2015. ^ "The Graham Norton Show, Series 18, Episode 6". BBC One. 30 October 2015. ^ "The Graham Norton Show: Dame Maggie Smith makes first chat show appearance in 42 years". Grimsby Telegraph. 30 October 2015. Archived from the original on 31 October 2015. 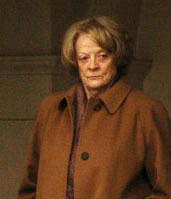 ^ "Maggie Smith Will Return to The Stage In A GERMAN LIFE". BroadwayWorld.com. Retrieved 14 February 2019. ^ a b Coveney, Michael (September 1992). Maggie Smith: A Bright Particular Star. Victor Gollancz Ltd. ISBN 0-575-05188-4. ^ Vincent, Alice (19 February 2013). "Dame Maggie Smith has no plans to retire from Downton Abbey". The Daily Telegraph. Retrieved 7 August 2013. ^ Howard, Pat. "60 Minutes: Dame Maggie Smith Retirement & Downton Abbey Season 4". Recapo. ^ Coveney, Michael (3 February 2007). "I'm Very Scared of Being Back on Stage". thisislondon.co.uk. Archived from the original on 19 January 2008. ^ Lawson, Mark (31 May 2007). "Prodigal Son". The Guardian. London. Retrieved 8 November 2011. ^ "There Is Nothing Like This Dame". The New York Times. 18 March 1990. Retrieved 7 August 2013. ^ "Maggie Smith discusses cancer treatment struggle". The Daily Telegraph. 5 October 2009. Retrieved 21 April 2014. ^ "Dame Maggie supporting Christchurch theatre". 3news.co.nz. 14 September 2011. Archived from the original on 25 December 2011. Retrieved 21 April 2014. ^ "The International Glaucoma Association Welcomes Dame Maggie Smith". glaucoma-association.com. Archived from the original on 13 March 2014. Retrieved 21 April 2014. ^ "Celeb paws 2014". cats.org.uk. Archived from the original on 16 March 2015. Retrieved 21 April 2014. ^ "No. 44999". The London Gazette (Supplement). 30 December 1969. p. 9. ^ a b Krizanovich, Karen. "Why we love Maggie Smith". The Daily Telegraph. Retrieved 6 March 2016. ^ "Theatrical artists in The Queen's Birthday Honours 2014". londontheatre.co.uk. 14 June 2014. Retrieved 15 June 2014. ^ "Downton Abbey star Dame Maggie Smith honoured". itv.com. 13 June 2014. Retrieved 15 June 2014. ^ "Honorary Degrees and the Star Figure". cinemastandrews.org.uk. Retrieved 22 December 2013. ^ "In conversation with Dame Maggie Smith". Mansfield College, Oxford. 23 October 2017. Retrieved 31 October 2017. ^ "Interview upon receiving the Shakespeare Prize". Damemaggiedaily. 26 May 1992. Archived from the original on 22 November 2013. Retrieved 3 December 2013. ^ "BFI Fellows". BFI.org.uk. Retrieved 3 December 2013. ^ "Dame Maggie Smith Receives 'Will Award' in D.C. April 10". Playbill. 9 April 1999. Archived from the original on 6 December 2013. Retrieved 3 December 2013. ^ "Actors Hall of Fame Inductees". actorshalloffame.org. 2014. Archived from the original on 27 August 2008. Retrieved 21 March 2014. ^ Thomas, Liz (19 September 2005). "ITV unveils Avenue of Stars". The Stage. Retrieved 21 December 2013. ^ "A short history of the National Film and Television School". National Film and Television School. Archived from the original on 28 August 2012. Retrieved 8 July 2009. ^ "Maggie Smith receives Critics' Circle award for services to the arts". The Stage. 1 April 2016. Retrieved 12 May 2016. Maggie Smith. A View From The Stalls by Caroline Février, The Book Guild Ltd, released 28 March 2018, 330 pages, ISBN 978-1912083411. Wikimedia Commons has media related to Maggie Smith.